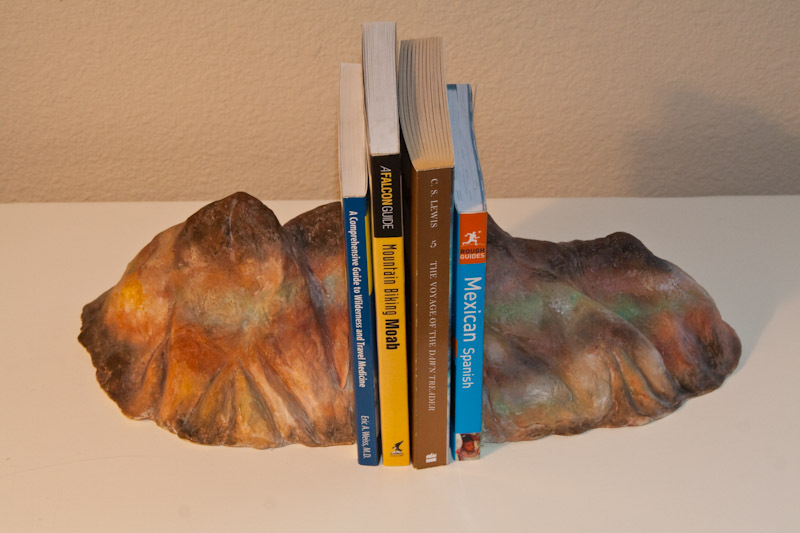 These sculpted bookends depict the mountains found in Death Valley, called Artist’s Palette. While hiking through the foothills there, I was taken in by them because of their colors, but the real thing that got my attention was the top of the mountains, which appeared to be covered with chocolate sprinkles. To top it off, the mountains looked like a multi-flavored ice cream sundae. Maybe I’d been out hiking too long without lunch, but I named this sculpture Desert Dessert. When I returned home from this trip, I couldn’t get the funky mountains out of my mind, and I just had to start sculpting them. The range’s official title is Artist’s Palette, and they are in the foothills of the Black Mountains. They are noted for having various colors of rock, much like those found in the famous Painted Desert in Arizona. The color variations are caused by the oxidation of different metals such as red, pink and yellow (from the iron salts); green from mica, while manganese produces the purple. Apparently a great deal of volcanic activity occurred here, which is why the mountain caps are sprinkled in black! If you are interested in an estimate for creating a reproduction of this sculpture by hand please contact me. 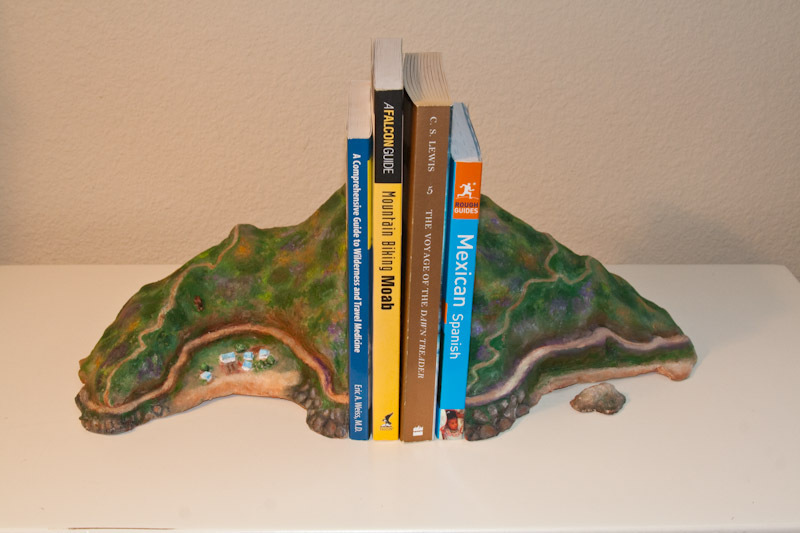 These sculptured bookends depict a stunningly beautiful, lesser known cove on Catalina Island, called Howland’s Landing, which is on the opposite end of the island from Avalon. Look closely and you can see the blue roofs of the cabins, which sit on the beach side. On the right side of the sculpture sits Emerald Cove, whose pristine waters contain some of the best snorkeling on the Pacific coast, and where I took my first plunge into the sport. I was well-rewarded for my minor bravery, as I got to see the gorgeous, bright orange Garibaldi, which I learned is the official State Fish of California and is protected in California coastal waters. If you are interested in an estimate for creating a reproduction of this sculpture by hand, please contact me . 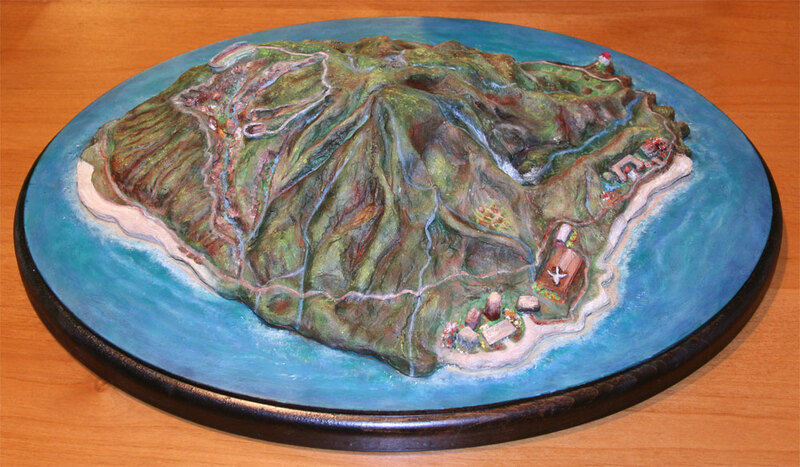 This sculpture of Kauai depicts the volcanic nature of the island. Lava flows are still present and lend a natural beauty to the earth’s red foundation. When sculpting this island, it was great fun to learn about Kauai’s canyons, its famous Napali Coast, and its cheery lighthouse. The island’s volcanic geology and geography have captured my interest and I’ve now added Kauai to my top list of places I’d like to visit. I created this island sculpture of Kauai, Hawaii for a client who loves to travel there often with his family. As I have not been to Kauai, I relied on my client’s photographs, coupled with satellite images of the island and its topography in order to create the sculpture. A hand painted reproduction of this sculpture can be created, using my new plaster and mold process. If you are interested, please contact me.